Mahindra Racing has become a familiar presence in top-level motorsport during recent years, entering MotoGP in 2011. The Mumbai-based outfit were the eighth team to join the FIA Formula E championship and look set to be a strong contender in their debut year. 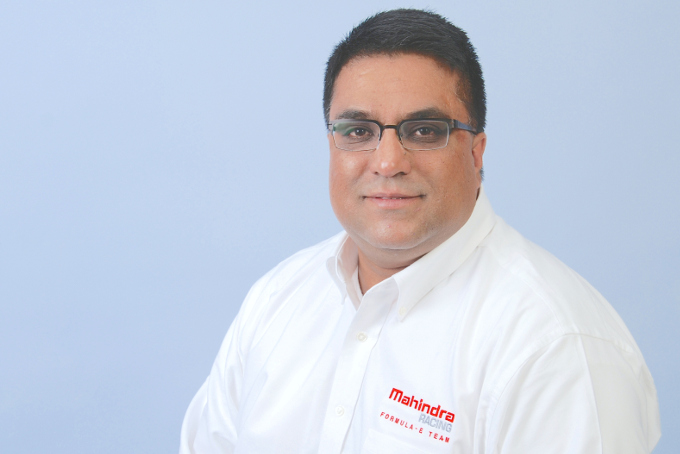 Team Principal Dilbagh Gill believes Mahindra’s background working in electric vehicle technology will provide a solid platform for success in the coming season. What was it about Formula E that appealed to Mahindra Racing? Over the last decade, the Mahindra Group has invested significantly in electric vehicle technology to develop advanced mobility solutions. Our group company Mahindra Reva has obtained many patents for its pioneering innovations in this arena. We believe that Formula E is the perfect platform to help enhance our knowledge and expertise of electric vehicles, while also helping us to transfer cutting edge technology to our road cars. What sort of challenges do you face before the season starts in Beijing? As this is a new race format altogether, the challenges are many. Starting from testing the car, getting used to the aerodynamics and becoming acquainted with the powertrain. Not to mention the simulation of battery energy consumption at different speeds. Additionally, as this is the first year, each team will use the same standard model. This means there can only be minor set up changes. Our expertise in power management and telematics will therefore be critical. Overall, we believe that we are putting together a very competitive package which will perform strongly. With over 15 million kilometres of electric vehicle experience there will be a lot that Mahindra Reva can contribute in making our Formula E team successful. What has been the reaction to Formula E in India? As a nation, India loves sports! Moreover, motorsports is becoming an increasingly important area of interest within the country. Young Indians are especially drawn to the sport. Mahindra Racing’s Facebook page has over 1.4 million fans and is one of the highest for any racing team in the world - more than even half of the Formula One teams. This indicates the kind of response we are receiving from racing enthusiasts in India. This has been the catalyst in driving our increasing ambition which has seen us entering new racing formats. Only recently we had nearly 500,000 visitors at the Auto Show in New Delhi where we unveiled the new livery for our Formula E car. None of the teams have got their hands on the Spark-Renault SRT_01E yet but from what you’ve seen how do you rate it? All indicators so far confirm that this is going to be an exceptional race car which will provide fans with very exciting racing. The whole package seems very promising and recent tests have only confirmed this. The test drivers have been very satisfied with the car and are convinced that there is a lot of potential. From my perspective, I think that it’s one of the best looking race cars! Does Mahindra Racing have plans to manufacturer its own electric car in the future and if so, what can you tell us about it? Mahindra is already on the path to becoming a constructor as we believe that this will add to our competitive advantage. Our 15 years’ of experience in developing electric vehicles along with advanced knowledge of power management and simulation is only going to help accelerate this process. We expect to be racing with our car from next season in 2015. Would you like to see more involvement from India in Formula E over the coming years? We hope to see more teams join Formula E from India. The interest level among enthusiasts has been growing; especially the youth at large has shown a tremendous response towards motorsports, and hence we believe more brands will come on board sooner or later. In addition to just more teams competing, there is a huge appetite for a race in India and our collective focus should be to have a race here very soon. Finally, do you have any news on potential drivers? Mahindra Racing has drawn interest from some of the best drivers in the world as they are keen to be in a competitive package. Mahindra is a global brand based in India, which is present in over 100 countries and has associates of over 60 nationalities among our workforce. This will be showcased through the selection of various members of our team. We will be presenting an exciting driver line-up very soon and there will be some pleasant surprises.